Volume 1 of the Routledge History of Philosophy covers one of the most remarkable periods in human thought. In the space of two and a half centuries, philosophy developed from quasi-mythological speculation to a state in which many of the most fundamental questions about the universe, the mind and human conduct had been vigorously pursued, and some of the most enduring masterworks of Western thought had been written. The essays present the fundamental approaches and thinkers of Greek philosophy in chronological order. Each is written by a recognised authority in the particular field, and takes account of the large amount of high-quality work done in the last few decades on Platonic and pre-Platonic philosophy. All write in an accessible style, meeting the needs of the non-specialist without loss of scholarly precision. 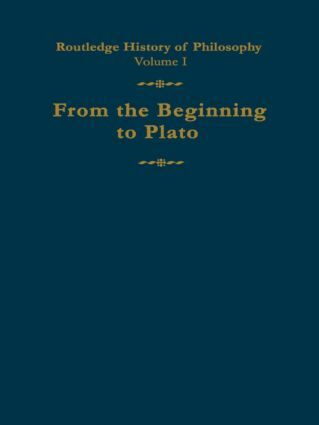 Topics covered range from early Greek speculative thought, its cultural and social setting, to the Sophists, Socrates and culminate in three chapters on Plato's lasting contribution to all central areas of philosophy. Supplemented with a chronology, a glossary of technical terms and an extensive bibliography, this volume will prove an invaluable and comprehensive guide to the beginnings of philosophy.